It was windy last night, but not very cold. And despite sleeping near the lake, our tent and sleeping bags were dry. We were slow to get going today. Knowing we had only 20 miles to hike gave us permission to sleep in a little. Around 7am we stepped out of our tent. As we finished packing a person went to retrieve their bear can from the nice tent site next to a boulder. Andy went down the hill toward him, said hello, and politely asked him not to store his bear can near tent sites so others can use them. Andy smiled and said have a good day, but nothing else. He wasn’t looking for an argument. He simply wanted this person to be more aware when storing his bear can. 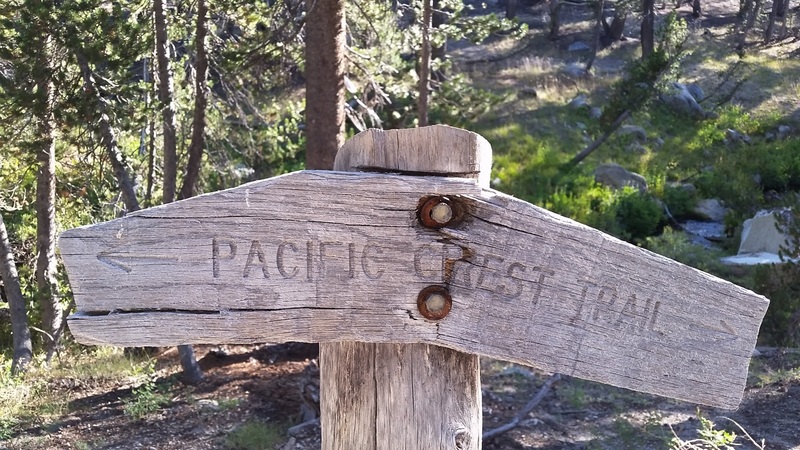 Typically, PCT hikers hike later into the evening (stopping around 7 or 8pm) compared to other backpackers, including JMTers, and small things like this bother us. Particularly when we get to camp tired and hungry. We walked toward the trail, still in the shadows of the hills. The sun was just starting to light up the tops of the jagged mountains around us. As we neared Silver Pass the wind intensified. Big grey clouds dominated the sky, but we weren’t terribly worried. We were in awe of the beauty around us. 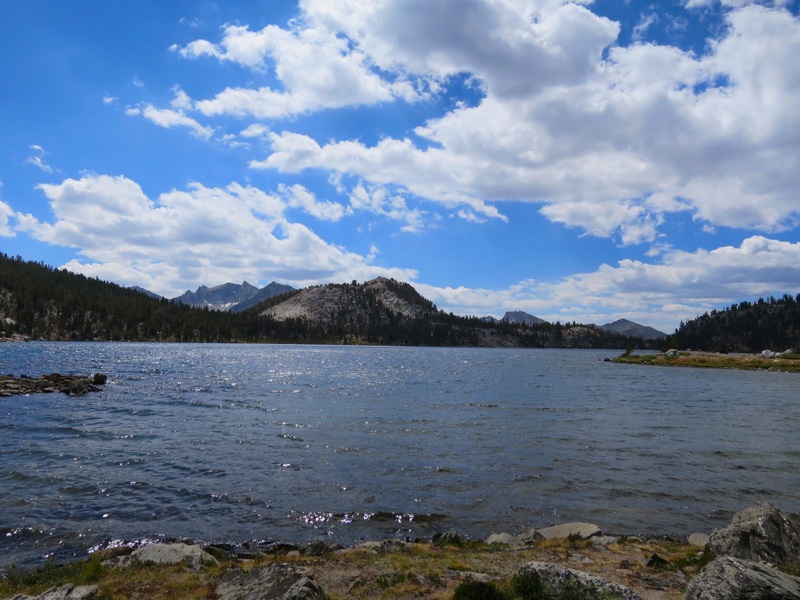 Clear blue lakes were surrounded by pointy granite peaks. 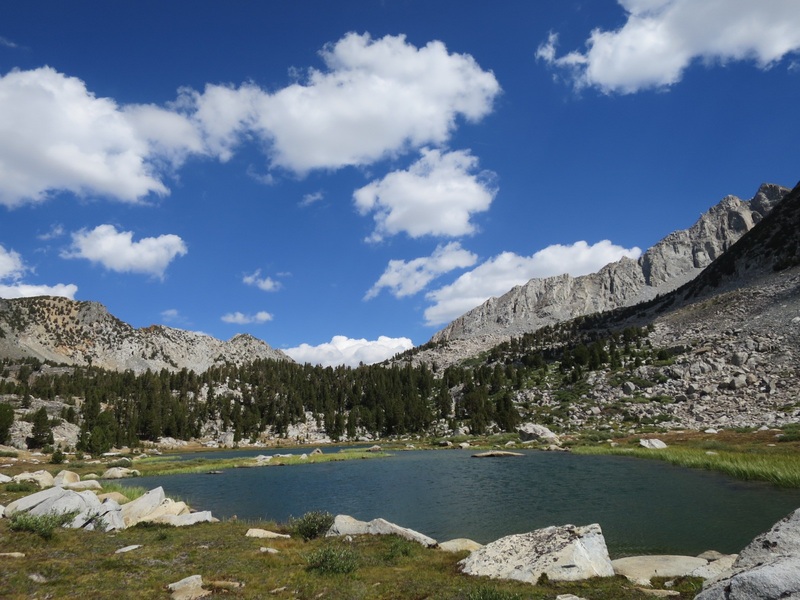 One look and it’s easy to understand why so many people hike along the John Muir Trail – in its entirety or in parts. Today we saw at least 100 other hikers, 98% were going southbound. We understand and accept that many people hike along this trail. 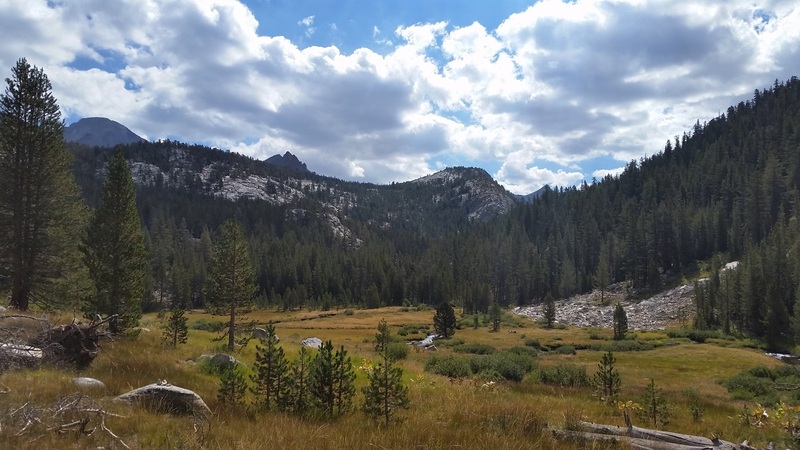 Andy has dubbed it the John Muir Highway instead of the John Muir Trail. We expected the crowds, but were surprised that many hikers either didn’t know or didn’t care to give the right of way to hikers going uphill. Do we hold our ground and not stop? Do we merge but say something? Laurie found herself playing Chicken with other hikers from time to time – especially the younger ones. We don’t mind giving way to hikers here and there but when we do this for miles it’s hard to get into a groove and make progress! 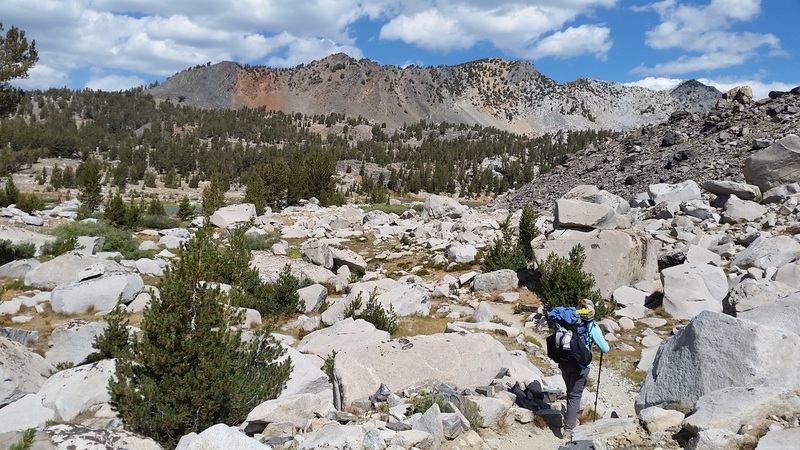 Hiking amongst JMTers provided an opportunity for each of us to reflect on how much we have changed since our respective JMT hikes in 2012. 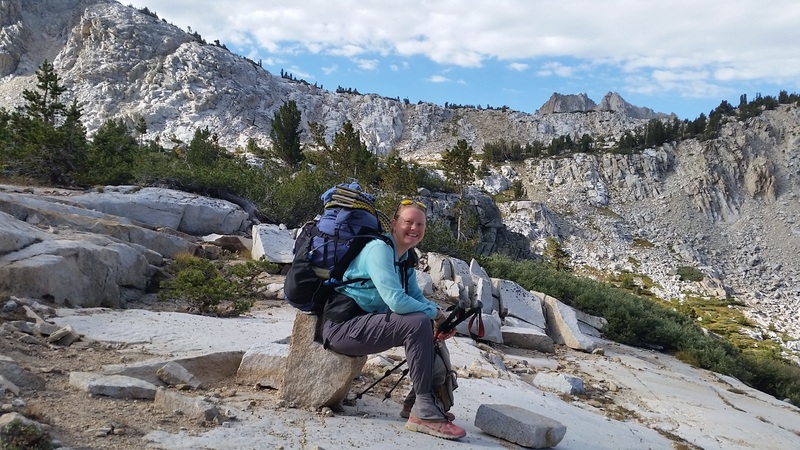 Laurie carries a much smaller backpack and wears trail runners rather than boots while Andy carries a stove and cares more about comfort than being ultralight. It is nice to see that we have had a good influence on one another’s backpacking style. When we reached beautiful Lake Virginia the wind was unrelenting. White caps covered the surface of the water. By the time we filled up our bottles we were ready to leave and get warm again. “But it’s so pretty here. Let’s stay and have lunch” Laurie proposed. We put on our warm layers, found a somewhat protected spot and enjoyed a beautiful view of the lake from afar. Laurie set up her camera for a time lapse while we ate lunch and expanded our to do lists. Before we knew it 30 minutes had passed. No matter though, we only had 12 miles to camp and most of that was on gentle downhill trail. 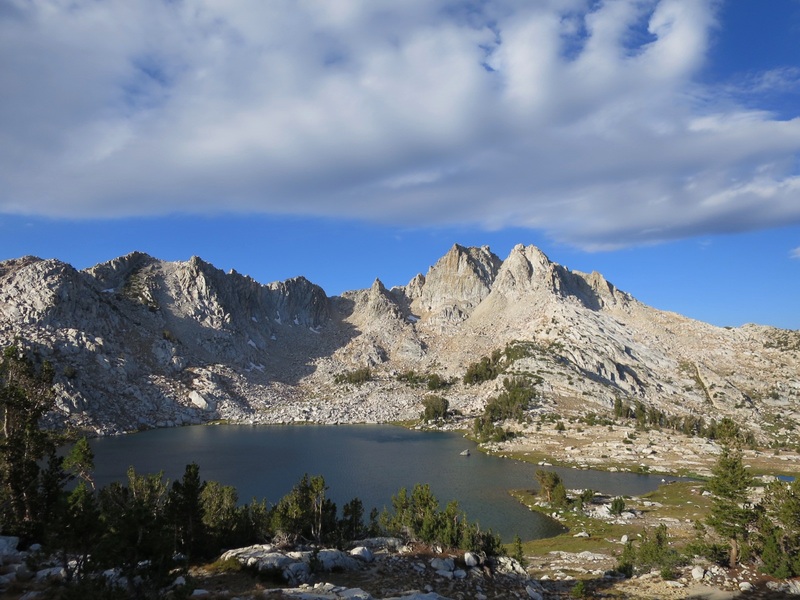 It was fun hiking the JMT north and seeing how much of it we both remembered when we hiked it southbound in 2012. Around 4:30pm we neared Deer Creek. As we collected water and took a short break we counted the number of tents already set up. Compared to other thru hikers we stop early, but compared to traditional backpackers we hike late into the evening. It was slightly unnerving to see so many tents set up so early. We wondered if there would be space for us at Crater Creek less than 3 miles away. 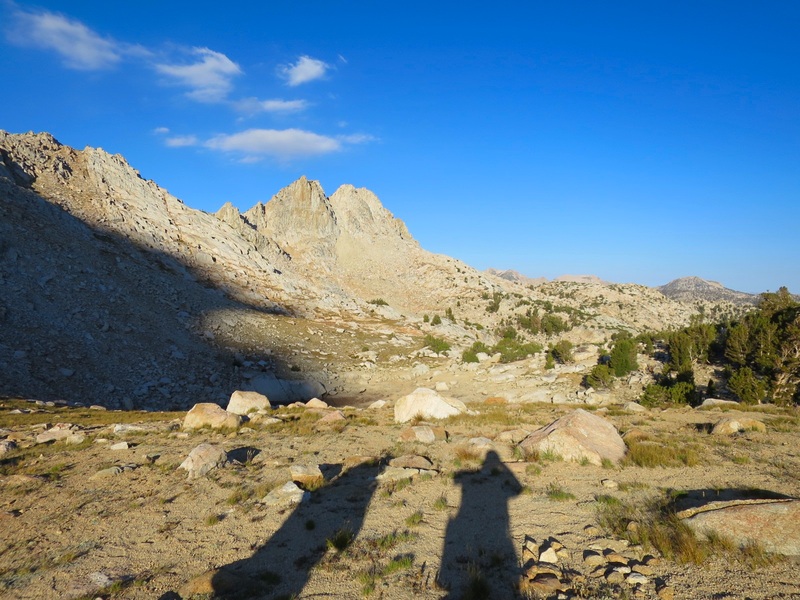 As we approached camp we noticed only one other person here – a northbound JMT hiker. You don’t see too many of those. Over 90% of JMTers hike southbound. We set up our tent, chatted for a while, ate cheese, and went to the creek to clean our feet. When Andy took off his socks he noticed a hole in the left one. He had a hole in his other brand new pair (in the same exact spot) yesterday too. We’re not sure what’s happening. As a precaution Andy cut his big toe nail. Hopefully this helps. After dinner we got cozy into our sleeping bags. Not a smart move because it makes it harder to get out and brush our teeth. But we did, and we are in our sleeping bags again. It’s only 8:30 and though we have to catch up on our blog we hope to be asleep by 9pm. 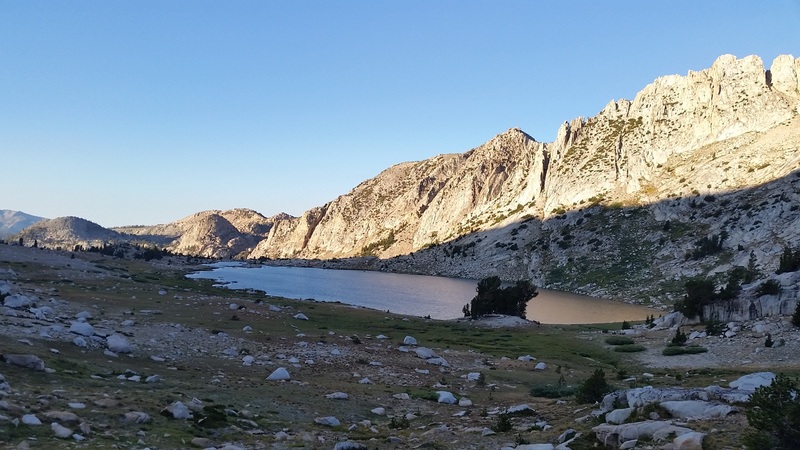 Tonight we are grateful for beautiful blue lakes and a relatively quiet campsite along the JMT highway.